I am a really big fan of Plan Toys and I cannot tell you how excited I was when I was given this opportunity to test out one of their new toys. Plan Toys makes high-quality and quite honestly beautiful wooden toys. But they are so much more than that too. It is one thing to say you make a green product but it speaks volumes when you can say that not only is your product green but the processes that you use to make it are green as well. PlanToys practices the "Three R's" of green living: Reduce, Reuse, and Recycle. Our manufacturing processes are designed to reduce waste and save energy. We reuse materials, and have introduced innovative methods to recycle paper and other products. We are always looking for new ways to improve and preserve our environment. 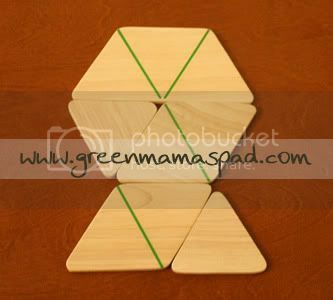 Plan Toys uses green materials in their toys such as organic rubberwood, water-based dyes and non toxic glues. They use solar energy and low emission biofuels to power the machinery that kiln-dries the wood as well as using biomass to produce heat. So in every possible way, they realy are a green company making green toys. 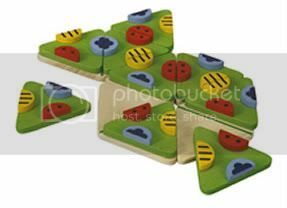 Plan Toys makes some really great educational toys and developmental toys and the new Trimino Bugs matching game (pictured above) is an excellent addition. Now I had no idea which toy they were sending me but I was thrilled when I opened up the box to find this one. Well, I would have been thrilled with anything they sent me. One of my favorite things about the Trimino Bugs is the vibrant colors. They immediately catch your eye and draw the kids' attention. 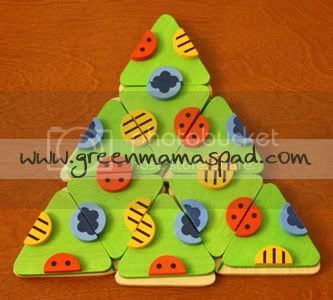 In the Trimino Bugs set there are 5 wooden tiles and 9 colored bug pieces. 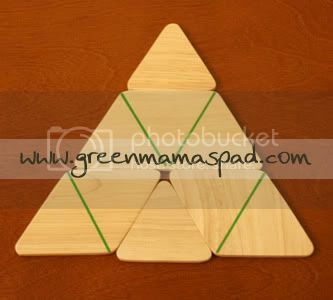 The wooden tiles are used to create your pattern. You can arrange them in any pattern you want, here are two that we came up with. Once you have your pattern set up with the tiles, then you can start using the bug pieces on top. The bug pieces are green with a different colored bug on each side: red, blue and yellow. And not all of the bug pieces are the same either. There are 2 slight variations. This adds a little bit of an extra challenge because you may only have all of your pieces matched up on top of the tiles but the bugs on the last one don't match up with the spot that is left. So the child has to rework their matching a little bit to make it all fit together. I have mentioned before on my blog that my twins (who will be 3 in May) both receive speech therapy and occupational therapy (for fine motor skills). So I immediately knew this would be a good toy for them. For one it helps them with colors and color words. There is also some logic involved which gets their brains moving and thinking. I loved watching them sit down and look at the pieces and figure out how to match them up. They honestly surprised me on how well they did with it. They even got silly after a while and would match up the wrong colors and then look at me and say "noooooooo". Now I focused on the twins with this so I never even showed it to my oldest (5) at first. Then one morning he saw the box, opened it up and figured it out all on his own. "Look mommy, I made a hexagon!" he told me and he had all of the bug pieces matched up already. I was impressed that he knew what the wooden tiles were for without any instruction for me. You can purchase Plan Toys directly from their site or use their Shop Locator to find a retail store near you. From baby toys to preschool toys, they have something for every child. Please note that the opinions and views expressed in this review are my own and based on my personal experience with the product. You may encounter a different experience with this than I did. Plan Toys provided me with a product for review. I work for a toy store that sells Plan Toys, and I have to say-the products are durable and gorgeous! They might be a bit more money, but they last so long and are such great quality that if my son was small I'd be buying them up. These products seam sturdy and trustworthy, the kind stuff i would give to my kids. Great post!